I am Sumitha, a student of History, doing research on Cave Temples of Pudukkottai District, as part of my Ph.D. Programme. I like to share my experience gained under my mission in this travelogue and it will be a virtual tour on the Cave Temples of Pudukkottai district. 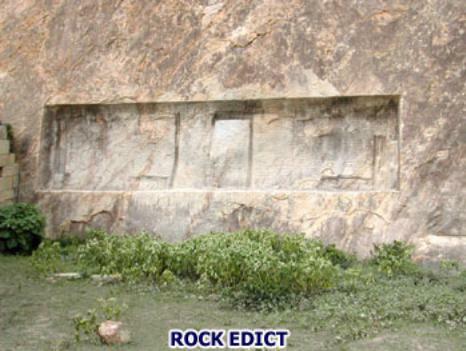 Pudukkottai though a dry and barren land is blessed with many rocky hills and hence a treasure trove of rock monuments. It was one of the homes of pre-historic man. In and around Pudukkottai, there are many vestiges of the oldest habitations of man and a very large number of burial sites also found in the northern and western parts of the district. 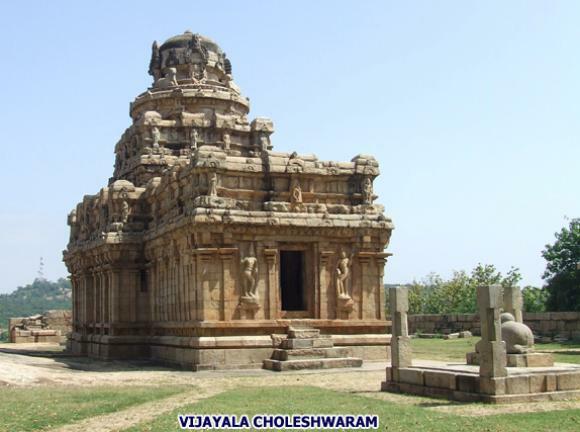 The Pallavas, Pandyas, Cholas, minor dynasties, Vijayanagar and Madurai Nayaks ruled over this part of the country and fostered its communal organisations, trade and industries and embellished it with temples and monuments of outstanding merit. It has a mixed legacy of antiquities, monuments and epigraphs. Thus its archaeological and cultural remains definitely prove to be a place of interest for tourists, pilgrims, students and historians. Dear readers this preface about myself and my vicinity of research will help you to be in the right track of my journey. On a Sunday we planned for a trip to Narthamalai one of my site1. Its my first field study on part of my research work. Dr. R.Kalaikkovan, Dr. M.Nalini, Mr. Bala Padmanaban and myself a team of four members started our expedition sharply at 8 am. from Tiruchirappalli. As it is winter the day was cool and the chillness lend a hand to cope with the midday heat. We gradually entered into the vicinity of barren land. We went through Kirannur and in a short drive of 45 minutes we reached Narthamalai. Except the trees on either sides of the road, the entire locale is arid and infertile with thorny bushes, scattered trees and shingled rocks. Now-a-days these areas are great industrial Hub. Many Small scale industries and Educational Institutions mushroomed throughout the area between Pudukkottai and Tiruchirappalli. We took a left turn from the main road and at first went to the Kadambar malai which lies to the northeast of the village. In between the main road and the Narthamalai Village a mud road branches off to the right and leads to this rocky hill. 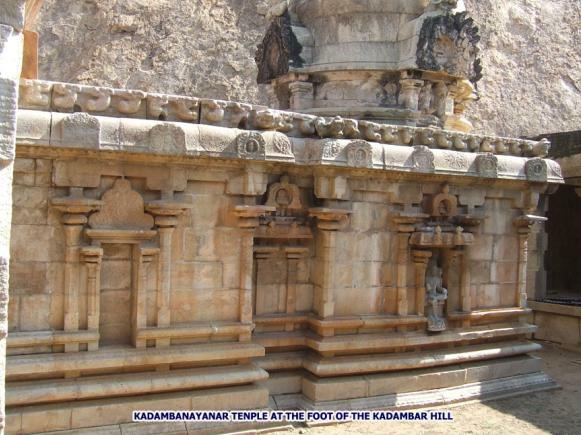 On the south-west foot of this hillock is located the Kadamba Nayanar temple, a shrine to Goddess Mangalambigai, and another shrine called Nagarisvaram. 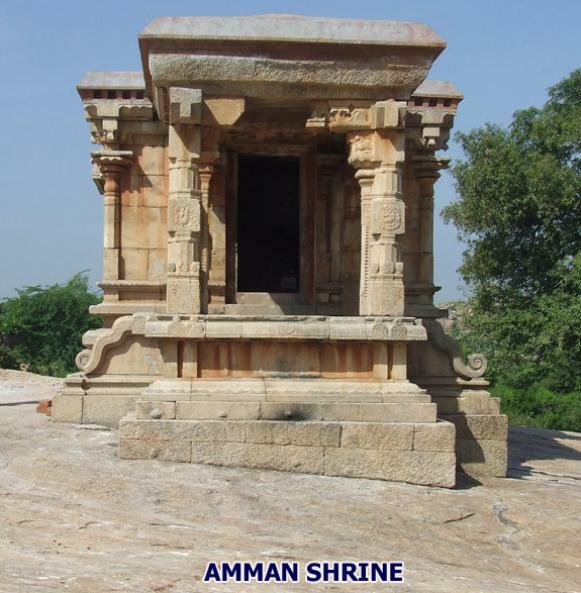 A small tarn is seen in between the Kadamba Nayanar temple and the Amman shrine. Inscriptions belonging to the time of Rajaraja I, Rajendra II, Kulothunga I and Maravarman Sundara Pandya are found. Two sets of inscriptions of Rajaraja I and Rajendra II are unique since they have been inscribed beautifully on a specially prepared surface and can be compared to that of Rock Edicts of Ashoka. The water filled trench surrounded by shrines and the huge hilly rock in the backdrop add grandeur to the place. I realised not only the blues and greens are beauty in this world even pale pink shingle rock can speak a tale of beauty. We spent an hour enjoying this tranquil beauty with our breakfast and proceeded to our real destination. The village Narttamalai lies nestled at the foot of a group of low hills . The hill group consists of nine and are called Mela-malai, Kottai-malai, Kadambar-malai, Paraiyan-malai, Uvachchan-malai, Aluruttimalai, Bommadi-malai, Man-malai and Pon-malai. Mela-malai or Western hill is also called Samanar-malai and some times Sivan malai. To the south-east of the village is a reserved forest. 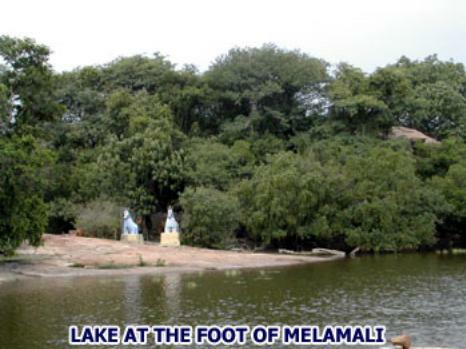 Its nearly a km from the main road to reach the village, which is very small with only few dwellings and to its west lies the Narthamalai or the Melamalai hill. The name Narttamalai was derived from the word Nagarattar-malai, or the hill of the Nagarattars. 'Nagarattar' is the name of the mercantile community called Nattukkottai Chettiyars or chettiyars. It was a mercantile centre or nagaram of the Ancient South Indian Merchant Guild called the Nana-desis 500. The Chettiyars, also known as Nagarattars of the present day are their lineal descendants and they inhabit now, what is known as Chettinad nowadays, an area beginning from Pudukkottai and extending southwards till about Sivaganga. Among the rocky hills, the Narthamalai is a huge and broad one running north-south direction and at its foot lies a huge pond which serves as water source of the village. Usually these types of tarns under the rocky hills are found at many places where the rain water gets collected from the hilly rock in the cavity below it, which forms this Lake. 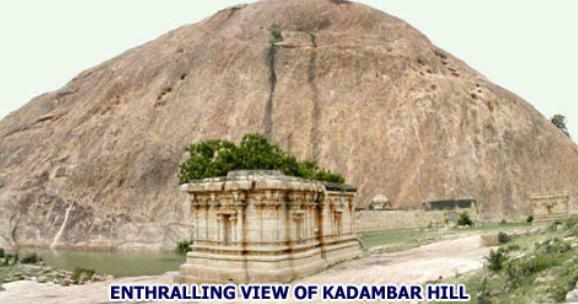 The Pazhiyileeswaram, Pathinenboomi Vinnagaram and the Vijayalaya Chozheshvaram are found at the summit of this hill. We walked along the bunt of the lake towards west and reached the starting ledge of the rock in the northern side. The rock's elevation gradually raises upto a maximum of 45 degrees and we walked in the apex a long way. Its a risky walk, at one place I really felt perilous, if we had a slip, then we will make a world record of highest tumbling dive into the pond. 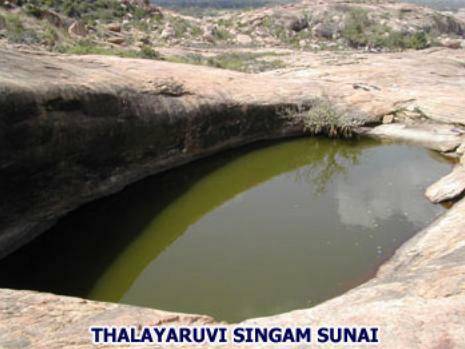 On the way we come across a mandapa and near it a superb open-air pool called the Thalayaruvi Singam Sunai. An ASI assistant informs us that a rock-cut shrine is inside the pool that can be viewed only when the water is drained. We relaxed a while near it and the ariel view of the village, the lake surrounded by the lush green paddy fields, the grazing cattles, the frolicking birds gives a awesome beauty to the place. Just Wordsworth is missing to sing this marvelous countryside scenery. In this milieu we further proceeded, and at one place it slopes a little downwards where we can see the nature's wonder, a portion of the rock remains flat and the hind portion of the rock behind the flat surface raises to high altitude and runs a long way. As one approaches the site, the sighting of the temple edifice among the sparse vegetation and shingled rock, is breathtaking. The two cave temples are excavated in the eastern face of the rock facing east adjacent to each other. And in the flat surface, in front of the caves is seen the Vijayalaya Choleshwaram facing west with 8 subshrines on its perambulation. Located on the top ledge of this hill, there is a somber magnificence about this Siva temple as it stands in it loneliness. The formation of the rock with a broad upper portion and a inclined lower portion gives a natural cavern in the lower part of the mother rock. Both the caves are excavated in the inclined portion of the mother rock approximately to a height of 8ft from the ground level. The upper portion of the rock is broad and naturally gives a roof projection to both the caves. 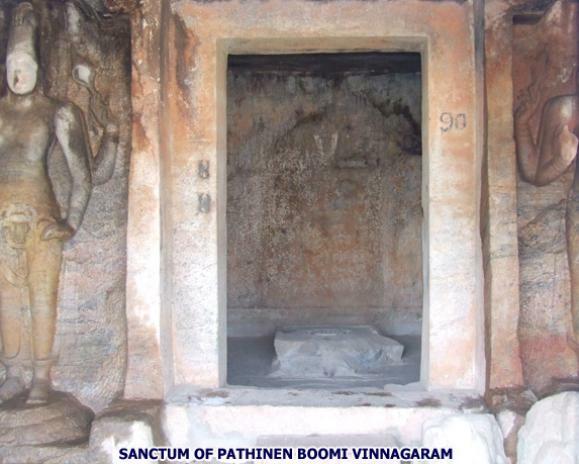 The Pathinen Boomi Vinnagaram or the Thirumerkoil is a big cave temple2, which has a rectangular mukha mandapa with a facade and a cubical central shrine. Another mandapa built in front of the cave is left with an adhisthana. Finished pillars and slabs seen scattered around the place are the remnants of the front mandapa. The rectangular structural adhisthana of the plinth area is of Prathibandha type and its central part is further projected towards east where the steps to the platform are seen in the middle. An interesting feature of this basement is the yazhi frieze with projected makaras in the corners and the frolicking yazhis, lions and elephants in the middle. A flight of seven steps leads us to the uneven floor of the platform and sculptures like elephants, squatted lion, saptamatrikas, Shiva, Veenadharar, makara thoranas, are seen scattered. 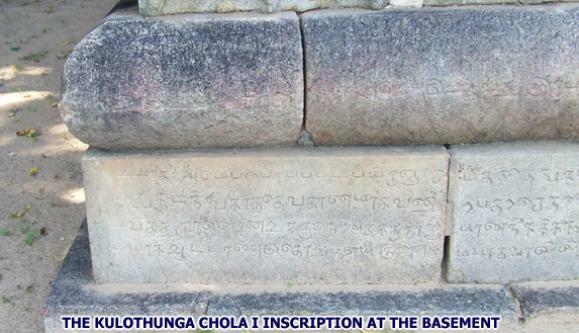 An inscription found at the basement dated 45th regnal year of Kulottunga Chola I speaks about the sale of land by Nagarattars to Thevan Perian (a) Mudikonda Chozha Telunga-araiyan for the conduct of daily worship to the Karumanikka Azhawar of Thirumerkoil. Another inscription of Maravarma Sundarapandya dated 12th regnal year of the king speaks about the consecration of Emperuman and Pirattimar and endowments made for the offerings. The facade of the mandapa consists of two massive pillars in the middle and a pair of pilasters one on either end. Due to the addition of the front platform, the lower part of the facade and the mother rock is not visible. Both the pillars and pilasters are rough and incomplete without any clear demarcation of sections. Only on the southern side pillar a slight demarcation is shown which has the square sections at top and bottom and octagonal kattu in the middle. Above the pillars is seen the potika, which are angular in type and holds the uttira and the vajana above. Among the middle pillars the one seen on the northern side has unfinished potika above the entrance. The demarcation of vajana is absent in between the northern middle pillar and the pilaster. The rough rock which extends as the roof of the cave forms the kapota, in which the canopy is flat without any inclination. 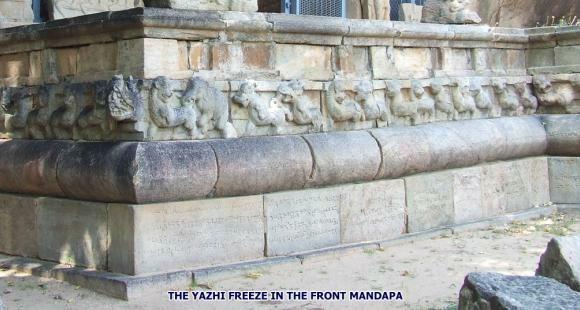 Bas-relief sculptures of dvarapalakas cut on stone slabs are kept in front of the middle pillars. The ASI has provided wooden gates to this mandapa to safeguard the monument. One has to step down from the facade to reach the mukha mandapa which is rectangular in shape. As like the facade the mukha mandapa is also incomplete with uneven flooring. Both the lateral walls and the hind walls of the mandapa together houses 12 huge bas-relief sculptures of Vishnu which are almost identical. These sculptures are seen on a raised platform approximately to a height of 2 feet from the mandapa floor level and stands on its own circular lotus pedestal. The lateral walls house one sculpture on each side, whereas the hind wall of mandapa is centrally parted for entrance to the central shrine and houses 5 sculptures each on the northern and the southern wall. The entrance to the sanctum is cut in the centre of the hind wall and enclosed by a pair of pilasters. The pilasters are plain with angular potika on the top and above the potika runs the uttira and vajana. Little inside the entrance door frames are cut on top and sides. A flight of two steps leads us to the shrine which conceals the original unfinished rockcut step cut out of the mother rock. The shrine cell is cubical in shape and in a raised level compared to that of mukhamandapa. 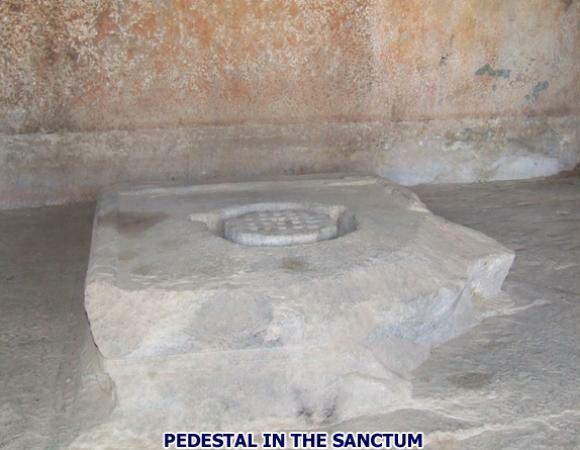 An unfinished defaced pedestal which forms the base of some deity is cut out of the mother rock to a height of 3 inch is found in the centre of the sanctum. The northern and southern face of the plinth is shown as a lotus pedestal whereas the western face is plain and the eastern face is disfigured. A spout is seen on the southern side of the pedestal. In the middle of the pedestal a circular cavity is seen. 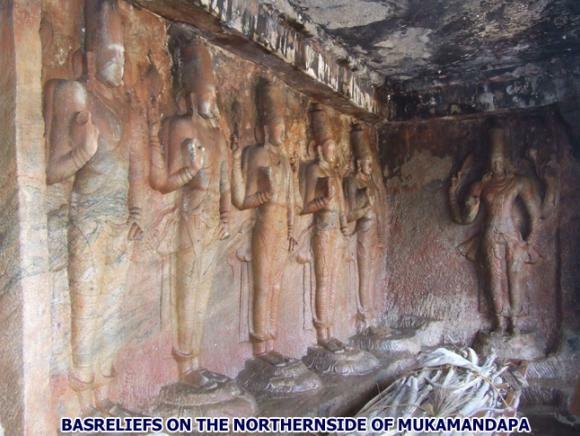 Among the sculptures the 12 bas-relief Vishnu sculptures are brilliant and noteworthy. All the sculptures are almost identical standing in a lotus pedestal and some of the pedestal are unfinished. All these sculptures are adorned with kiritamakuta in the head, the front hands are in abhaya and kadiyavalampita where as the back hands holds the sangu and erichakra. Hands are decked with circular bangles and makara armlets. The ears are elongated with makarakundalas, charapalli adorns the neck, udarabanda the abdomen and tzhaseri the ankle. The yajnopavita of beads pattern are worn in upavitha style. All the sculptures are clad in pattadai and kurangucheri with knots hanging on both sides. Both the dvarapalakas are standing straight with their outer legs in parsva. The one found to the right of the cave is disfigured and both of them are wearing a short dress with knots hanging on their sides, ears are adorned with patrakundala and a necklace around their neck. The Left hand of the right side dvarapalaka is on the thigh and the right hand is mutilated. The right hand of the leftside dvarapalaka is on the thigh and left hand is holding a bud. 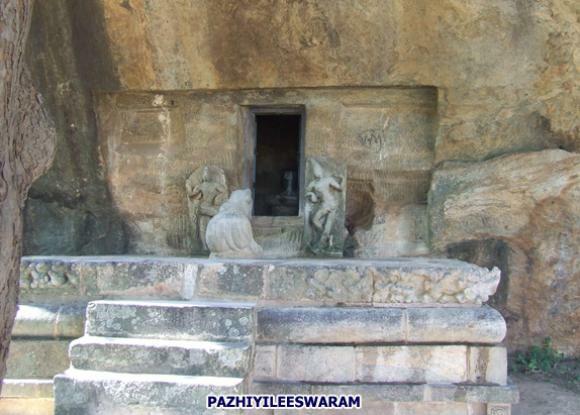 The saptamatrika panel is split into two with Nanmukhi, Maheshwari and Kaumari found to the right of the cave and Vaishnavi, Varahi, Indhirani and Chamundi are seen to the left of the cave. All these sculptures are seated in suhasana in a platform. As the sun veils behind the hillock we realised our return and packed our things. We slowly descent the place with obscure mind. 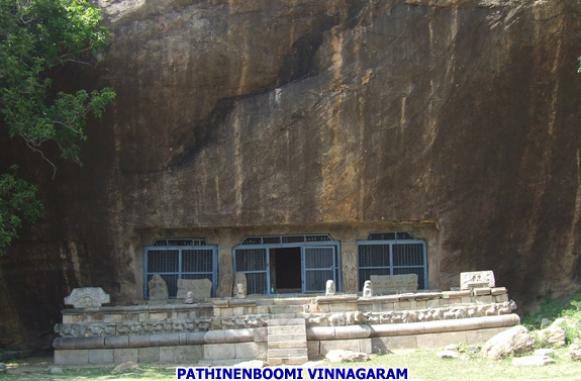 Though the cave called as a samanarkudagu, there is no evidence to attest the fact, the inscriptions mention it as Thirumerkoil and Pathinen boomivinnagaram. Another contradictory matter is the presence of Vishnu sculptures in the mukhamandapa and an avudaiyar like structure in the sanctum. The sparse vegetation, the huge hillock in the backdrop, aloofness of the place, all lends an aura of loneliness and forlornness to the place. Though badly battered by weather for more than thousands of years these monuments even now stands magnificently. Dear readers I welcome your comments on my account. Bye and meet you on my next journey. 1. Narathamalai was visited on 08-11-2007. I thank Mr. Muthu and Mr. Raghu, monument attendants for their help throughout the day. 2. According to Dr. R.Kalaikkovan this is the largest cave seen downsouth.